Shopping for a new Genesis G70? The base G70 2.0T model is well-equipped, so decide how important the extra equipment of higher trims and the extra power of the 3.3T are to you. The 2019 Genesis G70 luxury compact sedan pitches the nascent Hyundai brand into a turf war with cars like the 3-Series and C-Class. With the G70, Genesis isn’t just sending a message; it’s going straight into the boxing ring. With the G70, Kia raids the Stinger’s closet for parts to tackle new rivals such as Mercedes-Benz, BMW, and Audi on their own turf. Compared to the Stinger, the 2019 G70 is nearly three inches shorter between the wheels and nearly half a foot more compact, bumper to bumper. Compared to the Audi A4, BMW 3-Series, and Mercedes-Benz C-Class, the G70 is sized within two inches in most dimensions. The 2019 Genesis G70 relies on a 252-horsepower 2.0-liter turbo-4 or a 365-hp 3.3-liter turbocharged V-6 for motivation, paired with an 8-speed automatic with paddle shifters or a 6-speed manual. The latter is a surprise—Audi and Mercedes gave up their third pedal in the States like the man bun—and one of the key differences from the Stinger. The G70 comes in 2.0T and 3.3T models and Advanced, Elite, Prestige, Dynamic, and Sport trim levels. The 2.0-liter turbo-4 is the only way to get a 6-speed manual, and the 3.3-liter V-6 comes standard with an 8-speed with paddle shifters. All-wheel drive is available with both engines. 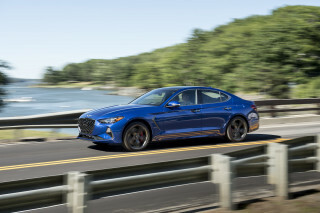 Launch control is standard on all models, and the G70 can run up to 60 mph in about 6.5 seconds with the turbo-4 and 4.5 seconds with the V-6. All V-6 versions and the 2.0T Sport get a limited-slip differential for better cornering and control, and uprated Brembos are available for shorter stops. All G70s get front struts and a rear multi-link suspension setup tuned for a canyon workout. Also on the docket for V-6 models are a 15-speaker Lexicon audio system, leather upholstery, 19-inch wheels with summer tires (rear-drive only), and uprated brakes. At the top of the lineup buyers get adaptive dampers, wireless phone charging, a head-up display, a surround-view monitor, nappa leather upholstery, and heated rear seats. Active safety features include adaptive cruise control, forward-collision warnings with automatic emergency braking, active lane control, and blind-spot monitors with rear cross-traffic warnings. The EPA rates the 2019 G70 at up to 25 mpg combined when it's fitted with the turbo-4, 20-21 mpg when it's gifted with the V-6. Aggressive but with a premium look from the Genesis family, the 2019 G70’s design reads like the upstart it is. The G70 and Stinger share engines and their architecture, but the G70 is 5.8 inches shorter on a 2.8-inch shorter wheelbase. The G70’s design follows closely the bigger G80, at least in broad strokes. What’s new? 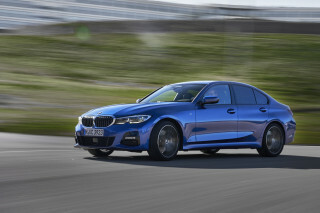 The G70’s aggressively shaped lower front bumper, nose, and front fenders apply for the new sedan’s performance credentials. Gaping intakes, strakes, and lighting pinch toward a six-sided mesh grille. The G70 has a short front overhang like the G80, and a creased hood that bookends the winged Genesis badge. In profile, the Stinger’s long hood is echoed by the G70, while boomerang-shaped trim that would like right at home on a Corvette adds visual drama to a body that reads more “upstart” than “establishment.” The G70’s body sides below the windows play with daylight more than the G80 and blue-haired G90; above the fold it takes the G80’s lead, by our eyes. The tail end tapers toward a trunk lid turned up slightly for a sporty look. Inside, the G70 is awash in diamond-quilted leather and horizontal lines along the dash. The center stack is angled toward the driver in a sporty setup, and technology comes into play with a screen that rises from the center of the dash. Fast and nimble, the 2019 Genesis G70 arrives as a worthy rival to German sport sedans. The G70 is smaller than the Stinger and it weighs between 55 and 123 pounds less, depending on the model. Strategic use of aluminum for the hood, front bumper beam, rear differential housing, and suspension components (MacPherson strut front and five-link rear) save weight and aid handling. Genesis offers the G70 with three levels of suspension tuning and they are all stiffer than the Stinger. 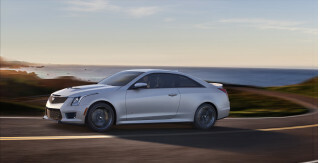 Four-cylinder models are the softest, V-6 models have rear spring rates that are 2.3 percent stiffer than any 4-cylinder model, and the 3.3T Dynamic Edition is 2.3 percent stiffer yet. Even the base 2.0T models ride firmly over bumpy pavement, and their rear suspensions make hollow, bobbling sounds over bumps. However, these cars will be the choice for most and their ride quality isn’t overly harsh. Some drivers may find that’s not the case for the 3.3T models, especially the 3.3T Dynamic Edition. We recommend Rust Belt buyers try before they buy. The upside to the suspension tuning is sharp handling. On a track or twisty road, the G70 flows gracefully from turn to turn, its steering providing a weighty feel and plenty of on-center stability. It tucks its nose nicely into corners and remains balanced. The Michelin Pilot Sport 4S tires on the 3.3T Dynamic Edition provide great grip, though the skinnier front tires can plow forward when carrying too much speed into a corner. That becomes more of an issue with the standard Michelin Pilot Sport 4 tires. The G70 is also willing to kick out the tail around corners (the AWD version less so), especially when the stability control is shut off. The available Brembo brakes provide a firm pedal and strong stopping power. In all, the G70 is a sportier sedan than the Stinger. It’s more predictable, sharper, and has more grip. Power is not a problem for the 3.3-liter twin-turbo V-6. While its peak horsepower arrives at a somewhat late 6,000 rpm, its 376 pound-feet of torque maxes out as low as 1,300 rpm. It has a whiff of turbo lag from a stop, but then enormous grunt as it rockets the car to 60 mph in 4.5 seconds. While it remains in the background most of the time, it bellows with an edgy howl when pushed. An 8-speed automatic transmission handles power and provides responsive shifts and rev matching to smooth out downshifts during performance driving. The Sport mode is fairly aggressive, but a Sport + mode would keep the engine on its toes even better. The turbo-4 delivers 252 horsepower with the automatic or 255 hp with its available 6-speed manual. It provides plenty of power for most drivers without much sound character. Expect 0-60 mph times of about 6.5 seconds. Only the Sport model matches the V-6s for sporty hardware, but the lighter nose means the 2.0T is more willing to snake through tight corners and switchbacks. A mix of sporty and luxurious, the Genesis G70 has an appealing cabin that is a bit light on rear passenger space. The G70’s interior ambience feels like a mix of Mazda Miata and Bentley Continental. The diamond-tufted leather upholstery and knurled dials could come from the highest level luxury cars, while the small-diameter steering wheel and the center stack canted toward the driver are sporty touches. The front seats are also sporty; they offer the bolstering to keep the driver locked in position during aggressive driving, and they also provide all-day comfort. Front-seat occupants have plenty of space in their individual pods, but the G70 loses much of its utility compared to the related Kia Stinger due to its smaller footprint. The rear seat in the G70 is livable for adults, but taller occupants will want for both leg room and head room. The trunk, meanwhile, has just 10.5 cubic feet of cargo space, less than half of the Stinger’s hatch area and about a quarter of the space in the Stinger with the rear seats down. At least the G70’s rear seat folds down. Lots of safety features are standard, but the 2019 G70 has yet to be subjected to crash tests. Standard safety features consist of a seven airbags including a driver's knee bag, a rearview camera, adaptive cruise control, forward-collision warnings with pedestrian detection and automatic emergency braking, active lane control, a driver attention warning system, automatic high beams, and blind-spot monitors with rear cross-traffic warnings. Advanced and above trim levels get front and rear parking sensors, and Prestiges add a surround-view monitor and adaptive headlights that point into turns. Loaded with features, the 2019 Genesis G70 offers 4- and 6-cylinder models for a variety of entry-level luxury budgets. The G70 comes in 2.0T and 3.3T models as well as Advanced, Elite, Prestige, Dynamic, and Sport trim levels. 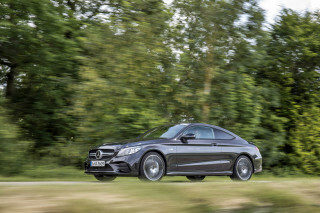 The 2.0T is offered in all trims, while the 3.3T offers all but the Dynamic trim. Rear-drive is standard and all-wheel drive with a heated steering wheel is available on all versions except the 2.0T Sport with the manual transmission. Genesis also offers two special edition models at launch: the G70 Dynamic Edition and G70 Design Edition, both based on the 3.3T Sport. The base 2.0T Advanced model offers plenty of equipment. Standard features include LED daytime running lights and taillights, heated exterior mirrors, 18-inch alloy wheels, a trunk that opens automatically if the key is detected nearby, a 12-way power-adjustable driver’s seat with 4-way power lumbar, an 8-way power-adjustable front passenger seat, a 60/40-split folding rear seat, dual-zone automatic climate control, a leather-wrapped steering wheel, and an auto-dimming rearview mirror with a universal garage door opener. Infotainment features consist of a 7.0-inch instrument cluster digital display, an 8.0-inch touchscreen with Apple CarPlay and Android Auto compatibility, HD radio, Genesis Connected Services telematics, and three USB ports. We recommend moving up to the Elite for features such as leather upholstery, a Lexicon 15-speaker audio system, front and rear parking sensors, a power tilt/telescoping steering wheel, heated and cooled front seats, a navigation system, and a sunroof. The 3.3T models are more sport-oriented. They include a limited-slip differential, Brembo brakes, a sport-tuned suspension, variable-ratio steering, alloy pedals, and 19-inch wheels on summer tires (all-seasons for the AWD version). They are also better equipped. The 3.3T Advanced has a power-adjustable steering wheel, LED headlights, navigation, leather upholstery, and the Lexicon audio system. The Sport adds features such as adaptive dampers, wireless phone charging, a head-up display, a surround-view monitor, nappa leather upholstery, and heated rear seats. The 3.3T Dynamic Edition is the sportiest model and the choice for buyers who want to take their cars to the track; it comes with Michelin Pilot Sport 4S tires, firmer suspension tuning, and performance brake pads. Given the power its engines make, the 2019 Genesis G70 returns decent fuel economy. The most efficient version of the G70 is the rear-drive model with the turbo-4 and the automatic transmission; it is rated at 22 mpg city, 30 highway, 25 combined. Switch to the manual and ratings drop to 18/28/22 mpg. With all-wheel drive and the automatic, the turbo-4 returns 21/28/23 mpg. The EPA rates the turbocharged V-6 with rear drive at 18/26/21 mpg, and the AWD version at 18/25/20 mpg. All engines require premium gasoline. Looking for a different year of the Genesis G70?